The crude star tattoo inked in a very light black color on this girl’s wrist is simple and fun. Star tattoos are especially popular for girls because they are versatile tattoo designs and come in a variety of different forms. 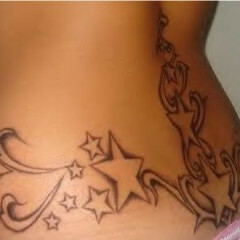 Some of the most popular star tattoo designs include stars with the moon, shooting stars, and stars with other feminine images like hearts or flowers. 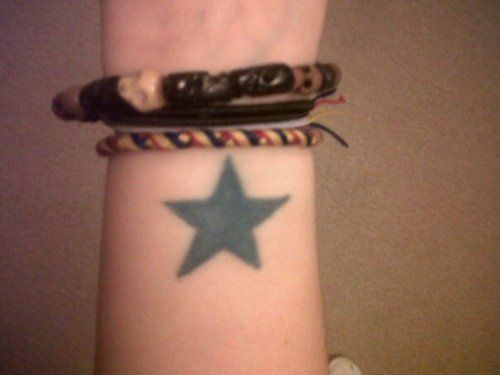 This girl’s star tattoo is very simple and is inked in black on the underside of her wrist. Even though she definitely wasn’t the first person to get a star tattoo, the fact that the wildly popular Rihanna has a trail of dark and light stars extending down her neck and back has definitely inspired other girls to get star tattoos. Star tattoos are also popular because they can have a number of different meanings, including a loved one lost, an important moment in life, and even protection or guidance.